Saint Peter's Basilica, is located within the walls of the Vatican, in Saint Peter's square, or Piazza San Pietro, It is a principle tourist attraction for visitors to Rome. Surprisingly, it is not the Pope's official ecclesiastical seat, this is Saint John Lateran, but Saint Peter's Basilica is his principal church, where most Papal ceremonies take place, this is due to its size, proximity to the Papal residence, and its location within the city walls of the Vatican. 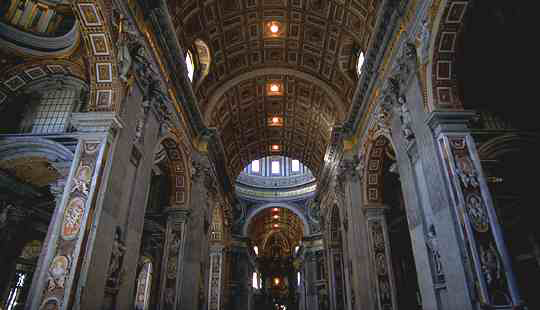 It is claimed that St Peter's Basilica was built at the site of Peter's crucifixion. Beneath the main altar there is another altar dedicated to St Peter. Recent excavations have discovered a burial chamber beneath this altar containing a skeleton, with its feet missing. Some archaeologists, amongst others, have suggested that these are the actual remains of Saint Peter. It is also claimed that a piece of plaster which had come off the marble lined repository in which the bones were supposed to have been buried in, bore the Greek inscription, PETROS ENI, "Peter is within". The interior, which includes 45 altars, has been decorated by many famous artists. Some of the most important works in the church are the Pietà by Michelangelo, the papal altar and the Throne of St. Peter, both by Bernini, and the Monument to the Stuarts by CanovaIt. 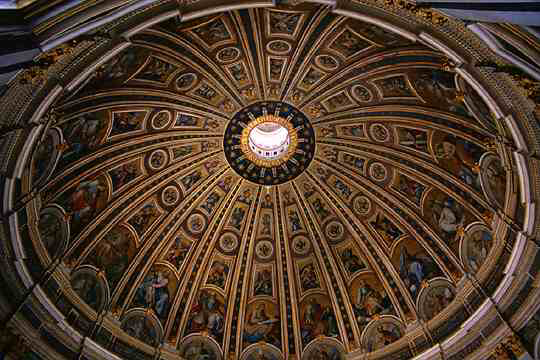 The dome or cupola was designed by Michelangelo, when he became chief architect in 1546. When he died in1564, the dome had only been finished as far as the base on which domes itself sits. Between 1585 and 1590, the architect Giacomo della Porta, with the help of the predominant engineer of the time, Domenico Fontana, constructed the dome. The following year Fontana built the lantern, and in 1593 the ball was placed in position. Michelangelo did not design the dome as a hemisphere, but as a parabola. On top of the paired Corinthian columns ribbing has been built that appears to be part of the drum, but in fact they stand proud of it more like buttresses. These help to contain the outward thrust of the dome's weight. The vaulted dome rises to Fontana's two stage lantern, which is capped with a spire.